BMW North America releases the entire pricing structure and details for their Model Year 2011. Yesterday morning, we published the pricing on the highly expected facelift 3 Series Coupe and Convertible, then later in the afternoon, we gave offered you a glance at the new Competition Package for the M3. The biggest change this year in the U.S. line-up is the introduction of the new, highly discusses, N55 Twin-Scroll engine. The new single turbocharged powerplant replaced the multiple award-winner twin-turbo N54 which remains available in the following models: Z4 sDrive35i and 740i/Li. A tuned up version of the N54 is also available in the new 335is and Z4is. The 2011 BMW 1 Series Coupe goes on sale this April with several improvements. In addition to the Value and Convenience Packages described above, the Cold Weather Package has been enhanced with a heated steering wheel and the retail price has been increased $150 from $600 to $750. A Harman Kardon Surround Sound System replaces the HiFi System Professional with no change in retail price ($875). In line with the very sporty nature of the 135i Coupe/Convertible, the 7-speed Double Clutch Transmission (DCT) replaces the STEPTRONIC automatic transmission with an option price of $1,575. The STEPTRONIC 6 speed automatic transmission will continue to be available on the 128i Coupe/Convertible for a retail price of $1,375. Base MSRP (including $875 Destination & Handling) for all the 1 Series models remain unchanged for MY2011. The 128i Coupe and 135i Coupe start at $30,025 and $36,925, respectively. 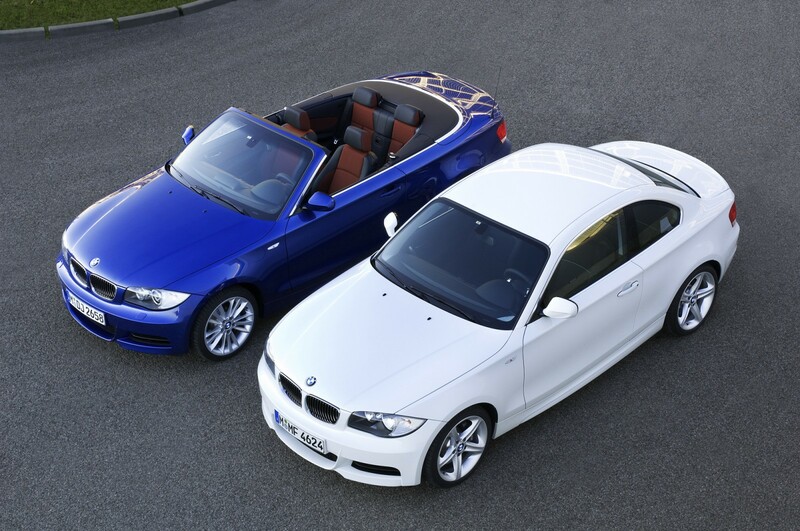 The 128i Convertible and 135i Convertible start at $35,075 and $41,225, respectively. The 2011 BMW 3 Series Sedan goes on sale this spring, and each model features changes worthy of mention. Headlining the news is BMW’s all-new 300hp inline-6 engine for the 335i Sedan. BMW’s enthusiast-celebrated 6-speed manual transmission remains standard, and the 6-speed STEPTRONIC automatic transmission remains optional for $1,375. New shift paddles (left-shift down, right-shift up) for the STEPTRONIC may be added to the Sport steering wheel for $100 when the $2,150 Sport Package is ordered. M Sport Package for $3,750. On all 3 Series models, the optional Harman Kardon Surround Sound System replaces BMW’s HiFi Professional System. The 328i Sedan and 335i Sedan start at $34,025 and $41,475, respectively, including $875 Destination & Handling. The 328i xDrive Sedan and 335i xDrive Sedan start at $36,025 and $43,475, respectively, including Destination & Handling. The 335d Sedan featuring BMW Advanced Diesel technology with BluePerformance starts at $44,825, including the 6-speed automatic transmission and Destination & Handling. BMW has substantially updated the 3 Series Coupe for model year 2011. Headlining the changes are new headlights and tail lights, a new hood and kidney grille, new side skirts, new wheels, and new front and rear fascias. Under the skin, the 335i Coupe has been fitted with the new “N55” twin scroll turbocharged inline-6 engine, and may be coupled to the standard 6-speed manual or optional 6-speed automatic transmission. In addition to the new Vermillion Red and Deep Sea Blue exterior colors, Mineral White Metallic exterior paint will be available on the Coupe starting in June. On all 3 Series models, the optional Harman Kardon Surround Sound System replaces BMW’s HiFi Professional System. Also, as part of the update, BMW has made new Bamboo Anthracite Wood trim available on the interior. Perhaps the biggest news for enthusiast coupe drivers is the arrival of the BMW 335is Coupe. This high-performance model features BMW’s award-winning twin-turbocharged inline-6 (N54), with output of 320 horsepower and 332 lb-ft of torque. A special overboost function permits a temporary torque increase to 370 lb-ft. Cooling the extra heat generated by the increased power is a standard oil cooler and an extra water cooler (radiator), as well as the enormous front air ducts included with the standard M Sport upgrades. An emotionally charged sport exhaust system has been fitted to perfectly capture the serious driving intentions of the 335is. Black kidney grilles, mirror caps, and Shadowline exterior trim lead the eyes to the rear where a rear diffuser with a body-color and black insert is located. Inside, the 335is Coupe receives a full M Sport enhancement with unique trim and badges. Those enthusiasts who prefer not to have it will appreciate the ability to delete the standard glass moonroof. For the first time on the 3 Series (excluding M3) the Double Clutch Transmission (DCT) will be available on the 335is as a $1,575 option. The 328i Coupe and 335i Coupe start at $37,075 and $43,525, respectively, including $875 Destination & Handling. The all-wheel drive models 328i xDrive Coupe and 335i xDrive Coupe start at $38,975 and $45,425 respectively. The high-performance 335is Coupe will go on sale in June at an MSRP of $50,525. Like the 3 Series Coupe, BMW has substantially updated the 3 Series Convertible for model year 2011. Headlining the changes are new headlights and tail lights, a new hood and kidney grille, new side skirts, new wheels, and new front and rear fascias. Under the skin, the 335i Convertible has been fitted with the new “N55” twin-scroll turbocharged inline-6 engine, and may be coupled to the standard 6-speed manual or optional 6-speed automatic transmission. In addition to the new Vermillion Red and Deep Sea Blue exterior colors, Mineral White Metallic exterior paint will be available on the Convertible starting in June. On all 3 Series models, the optional Harman Kardon Surround Sound System replaces BMW’s HiFi Professional System. Also, as part of the update, BMW has made new Bamboo Anthracite Wood trim available on the interior. Convertible drivers with a love for dynamic performance will be excited to learn of the new BMW 335is Convertible. This high-performance model features BMW’s award-winning twin-turbocharged inline-6 (N54), with output of 320 horsepower and 332 lb-ft of torque. A special overboost function permits a temporary torque increase to 370 lb-ft. Cooling the extra heat generated by the increased power is a standard oil cooler and an extra water cooler (radiator), as well as front air ducts included with the standard M Sport upgrades. Sport suspension and a sport exhaust system have been fitted to properly enhance the driving experience. Black kidney grilles, mirror caps, and Shadowline exterior trim lead the eyes to the rear where a rear diffuser with a body-color and black insert is located. Inside, the 335is Convertible receives a full M Sport enhancement with unique trim and badges. For the first time on the 3 Series (excluding M3) the Double Clutch Transmission (DCT) will be available on the 335is as a $1,575 option. The 328i Convertible and 335i Convertible start at $45,875 and $52,075, respectively, including $875 Destination & Handling. The 335is Convertible goes on sale in April and will start at $59,075 including Destination & Handling. 3 Series models, the optional Harman Kardon Surround Sound System replaces BMW’s HiFi Professional System. Also for 2011, Vermillion Red exterior paint replaces Barbera Red, and Deep Sea Blue replaces Monaco Blue metallic exterior paint. The BMW 5 Series Gran Turismo made its production debut at the Frankfurt Auto Show last fall and went on sale in December 2009 as a 2010 model. Therefore, it continues as a 2010 model this year, but there is still some news to report. In April 2010, the original BMW 550i Gran Turismo will be joined by the new 535i Gran Turismo, featuring BMW’s exciting new “N55” inline-6 engine. As the 550i Gran Turismo helped introduce the new 8-speed automatic transmission to the BMW line-make, the new 535i Gran Turismo will also feature the 8-speed automatic as standard. 0-60 mph acceleration will require only 6.2 seconds for the 535i Gran Turismo (5.4 seconds for 550i Gran Turismo). Compared to the 550i Gran Turismo, the 535i Gran Turismo features unique light-alloy wheel choices and forgoes some standard equipment, including auto-dimming mirrors, universal garage door opener, and Navigation system. Each 5 Series Gran Turismo model receives two new available exterior colors starting this spring, including Milano Beige and Damast Red. MSRP starts at $56,875 for the 535i Gran Turismo and $64,775 for the 550i Gran Turismo, including Destination & Handling. 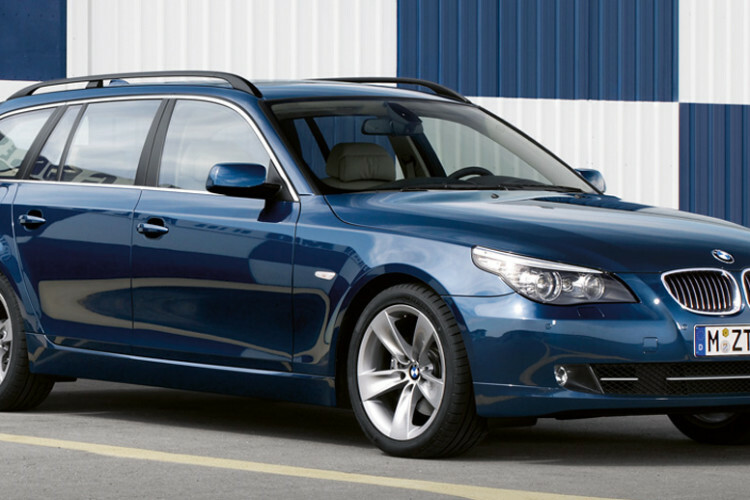 The BMW 5 Series Sports Wagon will continue through to the end of production in April as a 2010 model. The 535i xDrive Sports Wagon starts at $56,825 including $875 Destination & Handling. The BMW 6 Series Coupe and Convertible will continue as a 2010 models until the fall of 2010. The MY2010 650i Coupe and Convertible start at $79,325 and $86,425, respectively, including $875 Destination & Handling. The 2011 BMW 7 Series Sedan line that goes on sale this April will be the widest range ever in its 23 year history, comprising a total of 11 models. Along with the 750i xDrive, the 750Li xDrive, and the 760Li introduced last fall for MY2010, the 7 Series line will be supplemented by several new models and enhancements for 2011. The new MY2011 BMW 740i and BMW 740Li achieve a remarkable balance of power, efficiency, and sporty driving dynamics. Both models will go on sale in the United States as 2011 models in spring 2010. The 740i models feature BMW’s internationally acclaimed twin-turbocharged inline-6 engine (N54) with an output of 315 horsepower. All-aluminum engine construction, High Precision direct fuel injection, VANOS variable camshaft technology, and Brake Energy Regeneration are a few of the technologies used under the BMW EfficientDynamics engineering philosophy to place the 740i and 740Li among the most powerful six-cylinder luxury sedans in the world. Delivering power to the rear wheels is BMW’s 6-speed automatic transmission, well-known for fast, smooth gearshifts and an ability to intelligently adapt to the driver. Both models will be available with the full complement of well-known 7 Series options and packages, including the M Sport Package, Driver Assistance Package, Luxury Seating Packages, Rear Entertainment Package, and even the BMW Individual Composition Package. The MY2011 740i and 740Li start at $71,025 and $75,425, respectively. All pricing includes $875 Destination & Handling. In addition to the many improvements announced for the beginning of MY2010. The MY2011 750 models benefit from additional equipment enhancements. The Convenience Package (a $1,700 value), which includes soft close doors, electric trunk opening/closing and Comfort Access, is now standard. The Top-View function that gives a complete camera view around the car while reversing has been added to the Camera Package. The package price has been adjusted from $750 to $1,200 based on the additional functionality. Active Roll Stabilization is no longer standard on xDrive models but is included in the optional M Sport Package. The MY2011 750i and 750Li start at $82,875 and $86,775, respectively. The 750i xDrive and 750Li xDrive start at $85,875 and $89,775, respectively. All pricing includes $875 Destination & Handling. The all-new BMW 760Li Sedan went on sale in fall of 2009 featuring the latest iteration in BMW’s decades-long history of harmonious V12 engines. This newest BMW V12 produces 535 horsepower and 550 pound-feet of torque with help from twin turbochargers and High Precision Direct Injection. The outcome is a 0-60 mph time of 4.5 seconds in a stylish, luxurious package. The long list of standard features and amenities ensures the comfort of each occupant. While the 760Li will not change Model Years until September, the top-view function has been added as standard. The MY2010 760Li Sedan starts at $137,425 including $875 Destination & Handling. On the heels of the ActiveHybrid X6, BMW announced the production versions of the all-new BMW ActiveHybrid 7, which also made its US premiere at the Los Angeles Auto Show in December 2009. The BMW ActiveHybrid 7 will reach American shores late in the second quarter of 2010 as a 2011 model. Based on the 5th-generation BMW 7 Series, this unique car sets new standards for performance and efficiency in the premium luxury class. The symbiosis of a twin-turbocharged V-8 engine with a 3-phase synchronous electric motor gives the BMW ActiveHybrid 7 a combined output of 455 hp and maximum torque of 515 lb-ft from 2000 – 3000 rpm. Power is transmitted via an 8-speed automatic transmission with the electric motor positioned between the engine and the torque converter. The electric motor receives its supply of energy from a lithium-ion battery developed specifically for this automobile. The BMW ActiveHybrid 7 accelerates to 60 mph in 4.7 seconds, while delivering fuel economy approximately 15% better than the 750i and 750Li. Auto Start Stop maximizes efficiency by avoiding engine idling when stopped. The ActiveHybrid 7 is distinguished by aerodynamically-tuned ten-spoke 19-inch Aero wheels, and is available in Bluewater Metallic exterior paintwork. The BMW ActiveHybrid 7L has a wheelbase increased by 5.5″, all of which is devoted to the enhanced comfort of rear-seat passengers. Both models are available with a wide range of options from the portfolio of equipment offered on the BMW 7 Series. The MY2011 ActiveHybrid 7 and ActiveHybrid 7L start at $103,175 and $107,075, respectively. All pricing includes $875 Destination & Handling. The full complement of BMW 7 Series exterior colors remains available, in addition to the signature ALPINA Blue metallic paint. Both short- and long-wheelbase models will be offered. The BMW ALPINA B7 will go on sale at authorized BMW Centers in Spring of 2010. Pricing will be announced closer to the on-sale date. The all-new Z4 Roadster that was first introduced in the spring of 2009 will become a 2011 model this spring and offer the sport enthusiast with new several options. M Suspension, M Aerodynamic body package, 18” M light alloy wheels (with a 19” wheel option on the 35i), exclusive M exterior color Melbourne Red Metallic, M interior trim in Aluminum Carbon, sport seats, M door sills, footrest, gearshift lever, M steering wheel (with paddle shifters if equipped with Steptronic or DCT) and an Anthracite headliner. In addition, the M Sport Package can be combined with the Exclusive Ivory White Package (which adds Ivory White leather seats and trim on the dash and door panels) for a total of $5,350 on the Z4 sDrive30i and $5,050 on the Z4 sDrive35i. The MY2011 Z4 sDrive30i and Z4 sDrive35i start at $46,875 and $52,775 respectively, including $875 Destination & Handling. Second, the new 2011 BMW Z4 sDrive35is model distills the BMW Z4 Roadster’s performance potential to produce one of BMW’s fastest and best-handling Roadsters ever. It arrives at authorized BMW Centers this Spring 2010. This latest Z4 model is characterized by instantaneous response, a fantastic exhaust note, and a free-revving spirit. The engine features increased air intake flow and increased boost pressure to release more power. The turbocharger system developed for the engine of the new BMW Z4 sDrive35is maintains a high output throughout the entire engine speed range. Nominal peak torque is increased to 332 lb-ft available from 1,400 rpm to 4,500 rpm. Maximum output of 335 hp is delivered at 5,800 rpm. The BMW Z4 sDrive35is will complete the sprint from a standstill to 60 mph in just 4.7 seconds (preliminary). Top speed of the BMW Z4 sDrive35is is limited electronically to 250 km/h or 155 mph. Electric Power Steering (EPS) on the BMW Z4 sDrive35is features very sporty programming, focused to provide intense and clear steering feedback to the driver. This enables the driver to turn-in with remarkable precision and confidence at all vehicle speeds. The BMW Z4 sDrive35is includes new M Sport upgrades such as M Aerodynamics and adaptive M Suspension. The adaptive M Suspension combines a ride-height reduction of 10 millimeters (almost 0.4”) with electronically controlled shock absorbers to improve the vehicle’s agility without compromising ride comfort. The M Sport upgrades emphasize the Z4’s athletic character through aerodynamically optimized exterior features and customized interior components. Special 18-inch light-alloy wheels in five-spoke design round off the sporty character of the Z4 sDrive35is. 19-inch light-alloy wheels are optional. In addition, the new model is further distinguished by a striking front bumper with a matte aluminum trim bar in each outer air intake, a rear bumper with accentuated surrounds on the tailpipes, and a rear diffuser finished at top in body color and black textured surface underneath. Inside, a full complement of M Sport details augments the new Aluminum Carbon interior trim and available new Kansas Walnut leather. The MY2011 Z4 sDrive35is will retail for $61,925 including $875 Destination & Handling. The 2010 BMW X3 Sports Activity Vehicle continues unchanged through to the end of production later this year. The current X3 will be replaced with a new generation X3 produced in at BMW’s Spartanburg, South Carolina assembly plant. The MY2010 X3 xDrive30i begins at $39,725, including $875 Destination & Handling. The Model Year 2011 X5 models will begin production in April 2010. Detailed information on the MY2011 X5 models will be released later. The BMW X6 enters MY2011 with both increased efficiency and performance facilitated by the addition of an 8-speed automatic transmission and Brake Energy Regeneration. The result is that X6 xDrive35i accelerates from 0-60 mph in 6.3 seconds (reduced by 0.2 seconds) while the X6 xDrive50i gets to 60mph in 5.2 seconds (reduced by 0.1 seconds). Option changes include the addition of Lane Departure Warning and Active Cruise Control as stand-alone options for $950 and $2,400 respectively. Side View Cameras were added to Technology Package of the X6 xDrive35i making the new package price $2,500 and increasing functionality. The new Camera package for the X6 xDrive50i now offers both Side View and Top View for a retail price of $1,200. Finally, the Cold Weather Package is now $900 (reduced by $350) due to the deletion of the ski bag and heated rear seats. The MY2011 X6 xDrive35i and X6 xDrive50i MSRP remain unchanged at $57,375 and $68,075, respectively, including $875 Destination & Handling. The M3 Coupe, Sedan, and Convertible models become 2011 models this spring . BMW ups the ante on the M3 Coupe and Sedan by offering a new “Competition Package” for MY2011. The package further enhances the highly responsive chassis by installing a 10mm lower suspension and 19” wheels with greater offset for a wider track. Combined with remapped Electronic Damping Control and Dynamic Stability Control systems, the M3 with Competition Package is the best handling production M car ever built. The MSRP of MY2011 M3 Sedan, Coupe, and Convertible remain unchanged at $56,275, $59,275, and $67,925, respectively. All prices include $875 Destination & Handling. The Competition Package is available on the Coupe and Sedan models for $2,500. The car that invented the category of ultra-high performance sport sedan back in 1985 takes a hiatus for MY2011. A new M5 Sedan based on the upcoming 6th generation 5 Series is planned but not ready to be unveiled yet. The BMW M6 Coupe and Convertible will continue as a 2010 models until the fall of 2010. The MY2010 M6 Coupe and Convertible start at $103,225 and $109,025, respectively, including $875 Destination & Handling. The BMW X5 M and X6 M went on sale last fall as 2010 models in the United States. This spring they become 2011 models. Featuring an all-new BMW M Power V-8 engine with 555 horsepower and 500 lb-ft of torque, the X5 M and X6 M are the first BMW M products with twin-turbochargers, High Precision Direct Injection, xDrive all-wheel drive, Dynamic Performance Control torque-vectoring final drive, run-flat tires, and FlexRay on-board networking. The patented Cylinder-bank Comprehensive exhaust Manifold (CCM) perfectly feeds the two twin-scroll turbochargers with exhaust gas for maximum linearity and response. The results of these new technological solutions are a Sports Activity Vehicle® and Sports Activity Coupe each capable of 0-60mph in 4.5 seconds and truly world-class roadholding abilities, without sacrifice in comfort or versatility. Side-View Camera was added to the Driver Assistance Package. The Side view camera adds a significant addition to the outward visibility of the X5 M and X6 M, enhancing customer security in tight places. With this addition, the Driver Assistance Package retail price increases $400 from $1,800 to $2,200. The MY2011 X5 M and X6 M start at $86,375 and $89,875, respectively, including $875 Destination & Handling. In 2009, BMW introduced a “Value Package” – a $0.00 (No Charge) option that included leather upholstery and the integrated iPod adapter on the 5 Series and 328i/xi Sedans. As expected, the Value Package proved to be very popular, and as such, the concept is being extended to additional models. The $0.00 Value Package again includes leather upholstery and the iPod adapter as its key components but may also include several additional options, depending on the model. Throughout 2009 BMW spent time talking to Dealers and Client Advisors about possible ways to improve our option offering and the value of our package structure. Based on this feedback from Dealers and Client Advisors on, BMW has developed “Convenience Package” for the 1 and 3 Series for MY 2011. This package brings considerable value to a number of options that share the theme of Convenience and are typically ordered together anyway. The Convenience Package content varies depending on the model but always includes the Alarm System, Comfort Access (keyless entry) and Park Distance Control. It retails for as low as $1,000 on the 135i Coupe and Convertible. why use a 3-series touring pic for the 5-series touring? I guess the M6 is the last oppurtunity to buy the famed V10… guess the new 6er body style is not coming out till next year some time. at least the editors care – they changed the pic. using the right pic for the story is important in media communication, not only to make the readers easier to understand but also to show how much you care about your article. even a single image can tell its own story better than any word. we usually can interpret a picture to get information. of course, there’re people can’t get anything from pictures. they need everything explained or else they’re blank, just like you. I think that BMW should sell the X6 xDrive35d in the USA either. 2011 x5 M still 6speed auto? Not 8 speed? My vote is to introduce the 69 mpg 320d Efficient Dynamics to the US. That would be real progress and would steal the thunder away from Lexus with its boring Hybrids. The Alpina B7 is shweeet, but is it part of the BMW lineup? Seems to me that, no matter how closely aligned, it’s still a Tuner.